While waiting in line in front of the Apple Store in Austin, TX, our very own Damian Ragar and Stefani Lain had the chance to discuss with many potential buyers, and quickly realized that the vast majority of them were new to the iPad – about 8 out of 10 buyers did not own the original version of the tablet. 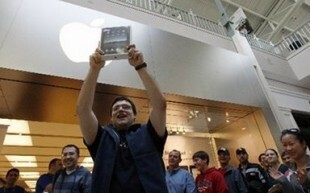 According to Gene Munster of Piper Jaffray, the situation was very similar at all Apple Stores across the country, as a survey conducted on hundreds of potential buyers waiting in line in New York City and Minneapolis revealed that about 70 percent of iPad 2 buyers were first time buyers. Munster is convinced that the high amount of new iPad customers is a clear sign that Apple’s supremacy in the tablet market will be extremely difficult to challenge. We believe this shows Apple is expanding its base of iPad users, which is critical to maintaining its early lead in the growing tablet market. As the user base grows Apple’s lead widens, and the company has a proven track record of building unmatched brand loyalty, which we believe will be a potent combination as the tablet market evolves. Interestingly enough, several news outlets believe that this high rate of first time buyers can be partially explained by the fact that many buyers were not planning to keep the device, and bought it to immediately resell it on the gray market, in order to make a profit. While this is partially correct, as thousands of iPad 2 listings have have flooded eBay over the weekend, we’re not convinced that the amount of iPad 2s destined for the gray market was significant. For instance, in Austin, TX, lines were full of excited buyers eager to purchase the device, as most of them had been holding off for months, waiting for the second generation iPad to be released. While Apple quickly ran out of stock, new units are supposed to be shipped to Apple Stores across the nation throughout the week – if you couldn’t buy an iPad 2 last Friday, you might want to swing by your local store once in a while to see if the iPad 2 is back in stock.